Rosie and Gerry were living in the Los Angeles area at the time, and Gerry had recently retired. “The kids thought it would be fun, and we went from there,” Rosie says. That was in 1996. They built the winery while living in a trailer on the property “and eating a lot of peanut butter sandwiches,” opened in 2000, and have been growing ever since. The original staff of eight (“all Wilsons”) became a staff of 172. Twenty acres grew to 93 acres. A restaurant was added in 2008. Today, on a good weekend, it’s not uncommon for Wilson Creek Winery to welcome 1,000 visitors per day to its tasting room. The restaurant serves an average of 500 people at its Sunday brunch. More than 100 weddings are held each year, plus other events nearly every evening. When the Wilsons opened in 2000, they were the 12th winery in the Temecula Valley, an up-and-coming wine region located about an hour northeast of San Diego. Now there are 42. It might be easy for Wilson Creek to get lost in the shuffle if it were not for two key things: family and almond champagne. “Our motto is ‘family first,’” Rosie says. Wilson Creek is first and foremost a family business. 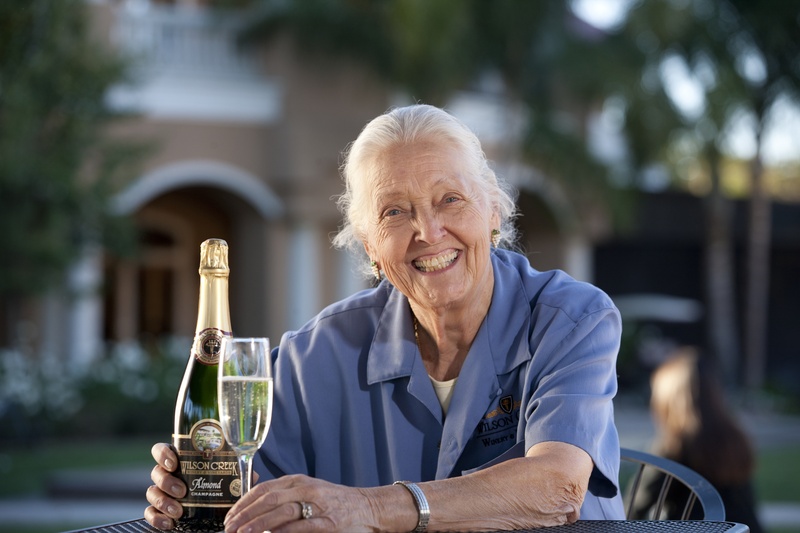 On any given day, members of the Wilson family can be found throughout the winery. As for the almond champagne, that was a little more serendipitous. The almond champagne made Wilson Creek stand out from the other wineries. Wilson Creek has a popular wine club and a loyal customer base. Diners rave about the winery’s old-fashioned service and personal attention. Rosie and Gerry are clearly having a blast with their “little winery” business. Rosie (’52 child development) grew up in Ames, Iowa. Her father, Prof. C.A. Iverson, was the head of Dairy Industry at Iowa State and was the VEISHEA faculty adviser for 25 years.